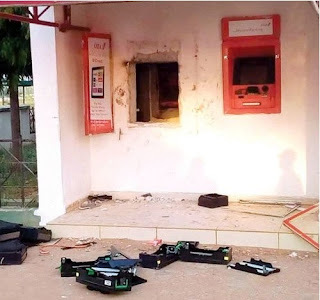 Reports as a 15-man gang invaded the main campus of the Ibrahim Badamasi Babangida University (IBBU) in Lapai, Niger State and vandalized the Automated Teller Machines (ATMs) of a second-generation bank. The hoodlums carted away an undisclosed amount of cash. According to the reporters, the uniformed hoodlums entered into the campus on Lapai-Paiko-Minna Road through a bush path. A security guard, who was on duty, said that the robbers arrived on that fateful day the school premises around 3 am. He said they were armed with guns, machetes, daggers and spiked clubs. The robbers, he said, night have been given a tipped-off by someone who knew the ATMs were loaded with cash the previous night. The source said the robbers came in three vehicles, which were parked a few meters away from the school gate. “They came down and gained access into the campus through a bush path,” the source said. A cadet officer, who was assaulted by the robbers said: “I was watching over the school Administrative Building, which is not that far from the ATM gallery. It was around 3am or thereabouts when I saw three armed men dressed in uniforms, standing beside the ATM Gallery and signaling to me to move towards them. One of the security men said they fell for the hoodlums’ trick because of the uniform, adding that the communication among the robbers indicated there was an informant that gave the hoodlums a tip-off. The robbery, he said, was “perfectly executed”. He said: “None of us thought they could be robbers because of the way they were dressed. We thought they actually caught thieves, since they were in uniforms. We later knew it was false alarm used to gather all of us in one place. They vandalized and looted the ATMs without being repelled. Although the robbers overpowered the security men guarding the ATMs, the reporters gathered that some other security guards escaped. One of the escapees said he ran into the bush when he saw how the robbers were beating his colleagues. He said there was no security guard that could have confronted the “dangerously armed robbers”. It was gathered that the robbers used a sledgehammer, axes and chisels to destroy walls of the ATMs’ gallery. They made their way into the ATMs’ cubicles and looted the cash loaded in them the previous night. The machines were completely destroyed. The hoodlums, it was learnt, fled the campus some minutes past 5am, after operating for about two hours. The newsmen gathered that police arrived on the campus shortly after the robbers escaped. The Vice-Chancellor (VC), Prof Muhammad Nasir Maiturare, led top members of the management to the scene on assessment. He said the incident would investigate to prevent a recurrence.